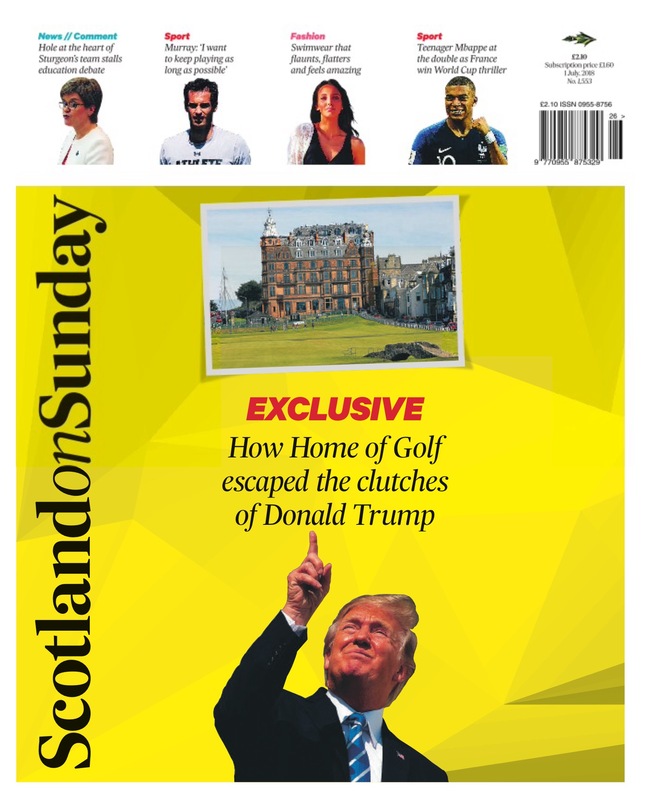 Donald Trump’s failed attempts to buy landmark St Andrews hotel – from Scotland on Sunday – An investigation into how Donald Trump was refused £38m in financing from the Bank of Scotland as he attempted to create his inaugural international hotel resort. The unsuccessful deal raises questions about the notoriously opaque finances of Trump and his network of companies. Three weeks after trying in vain to secure the Bank of Scotland’s backing, Trump claimed his firm was in a “very, very strong” cash position, while his right-hand man said the company had £1bn in cash. But forensic details of Trump’s dalliance with the home of golf are laid bare in court documents filed with the US district court in Rhode Island. It is there, in the city of Providence, that the Bank of Scotland filed a civil lawsuit against the Wasserman family, Hamilton Hall’s previous owners, who held extensive talks with Trump about a sale. The bank went to court seeking millions of pounds it was owed after the Wassmermans’ plans to transform the St Andrews property into a luxury timeshare scheme came undone. The subsequent slew of correspondence, contracts, and depositions provide a blow by blow account of Trump’s hardline negotiating tactics. Having visited Menie Estate, where his inaugural Scottish development would take shape, he travelled by helicopter to Fife. At the time, Trump was best known as the protagonist of The Apprentice, the US television show, and he readily indulged in his celebrity status. Wearing a dark suit, black and white striped tie, and a three quarter length black overcoat, he posed for pictures straddling the Old Course’s famous Swilken bridge, delivered his “You’re fired!” catchphrase on demand, and even autographed one reporter’s notebook. The reporter had not asked for his signature. In its heyday, the building, designed by Glasgow architect, James Milne Monro, served as The Grand Hotel, an elegant bolthole which welcomed famous guests such as Edward VIII, Rudyard Kipling, and Bing Crosby. Though it would later become a hall of residence for the University of St Andrews, and suffer a damaging fire started by a careless painter’s blowtorch in 1976, the property’s distinguished shone through. Evidently, it appealed to Trump. ON 11 AUGUST, just 15 weeks after his St Andrews visit, the Trump Organisation entered into a confidentiality agreement with a firm called St Andrews Grand Ventures LLC. It was run by the Wassermans, a New England family with a modest track record in developing shopping centres and office blocks in their native US. In a series of depositions given as part of his court case against Bank of Scotland, Wasserman said the Trump Organisation had expressed an interest in becoming a partner, or potentially buying control of the St Andrews Grand venture. Yet the 58-year-old’s initial contact and early talks with Trump’s business did not propose an outright sale. Instead, they envisioned leveraging Trump’s global profile to bolster the project’s equity and marketing potential. “We determined that Donald was willing to join the project as a limited guarantor, putting his signature behind the project, which is, I would say, equity unto itself,” reasoned Wasserman, a former law firm associate with a penchant for modern art. This time, the letter specified, it would “be known by a name to be determined by the parties which shall include the name ‘Trump’.” While Trump and Wasserman would serve as “co-managers” of the property, billed as a “super luxury membership club” with 23 residences, the agreement stated that Trump would license the use of his name to the joint venture for a nominal sum of £1. Trump was to be given responsibility for all design and architectural plans at the property, and would be tasked with marketing and managing it. In return, he would receive various sales, marketing and management fees. The letter of intent also specified that Trump personally had to buy his own membership bond of a Hamilton Hall apartment. At his executive office on the 26th floor of Trump Tower in New York’s Fifth Avenue, a space where sporting memorabilia vies for wall space alongside portraits and framed magazine covers, he welcomed a visiting party. It included David and Bernie Wasserman and their legal representatives, as well as two Bank of Scotland executives, Charles Wighton and Donald Kerr. The former was an area manager with the bank, while the latter headed up its powerful corporate and commercial division. Charles ‘Chip’ Rogers Jr, managing director and legal counsel for the Wassermans, said the meeting in New York with the extended Trump clan ran on for nearly three hours. The parties first met with Trump himself for between a half hour and 45 minutes, Rogers said, during which time, the billionaire played up to his reputation. “If you’ve ever watched TV, you know what to expect from Mr Trump, so we got a lot of that, ‘I’m the greatest’ sort of stuff,” he recalled in his deposition. Rogers added that the meeting was followed by further discussions with Ivanka, Eric, and Donald Jr, which lasted around two hours. HOWEVER THE MEMENTOES changed hands, no contracts followed suit. But the deal was very much alive. Over the next year or so, Wighton said he held several telephone conversations with Trump. “They were chiefly one way in terms of Trump saying, you know, for him to get involved in the transaction, he needed the bank’s support to do so,” he recalled. Companies House records show that Trump incorporated a new firm on 23 May 2008. Registered at offices in Edinburgh’s Castle Terrace, it went by the name of Trump Hotel St Andrews Limited. Its directors included Trump, Donald Jr, Eric, Ivanka, and Allen Weisselberg, the Trump Organisation’s chief financial officer. George Sorial, the firm”s executive vice president and counsel, was named as the secretary. This time, he did not propose going into a partnership with the Wassermans. Instead, he looked to take the property off their hands lock, stock, and barrel. The offer was not made through a legal firm or a property agent, but in a two-page letter signed personally by Trump. The deal, however, was not as straightforward as Trump’s rhetoric suggested. The letter saw him ask the Bank of Scotland to take back the purchase price in the form of a 15 year mortgage for £23m, with the loan incurring no interest for the first two years. After that, he proposed the interest rate be set at five per cent for five years, rising a further percentage point for the duration of the term. The disparate parcels of land in Menie Estate which formed his inaugural Scottish golf course were purchased for £9.5m in cash, and Trump bought the South Ayrshire jewel of Turnberry in a £35.7m cash deal. The use of money instead of mortgages is also true of his worldwide business affairs over the same period. A recent Washington Post investigation detailed how, in the nine years before Trump ran for the presidency, the Trump Organisation spent upwards of £400m in cash to acquire various properties. For the bellicose developer who once described himself as the “king of debt,” the Hamilton Hall deal bucked a trend, almost signalling a return to this formative years in New York. 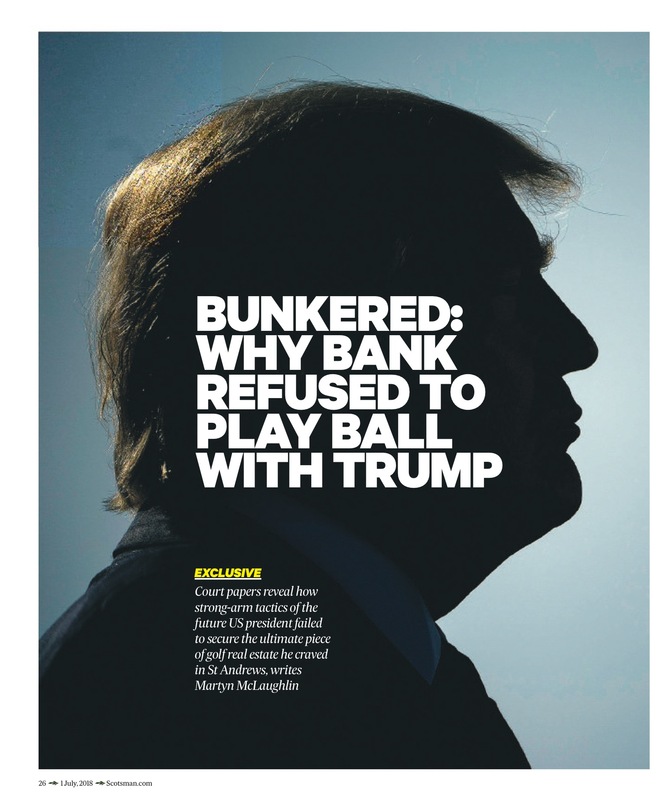 The question of why that was the case may be answered in part by a legal dispute at the time between Trump and Deutsche Bank, his lender of choice. On 7 November 2008, Trump had been due to pay the German firm £30m he had personally guaranteed on a £481m construction loan given to him for his Trump International Hotel and Tower in Chicago. With the recession biting, Trump made a bold move. He filed a lawsuit and, citing a “force majeure” clause, demanded the bank pay him £2.26bn for undermining the project and damaging his reputation. Deutsche Bank, in turn, sued Trump, and the two parties were locked in dispute before eventually reaching an out of court settlement in 2010, with the loan extended for five years. Did that episode impact on the Trump Organisation’s ability to raise finance? Not according to Trump and Mr Sorial, both of whom claimed at the time that the firm had no problems with finding money. 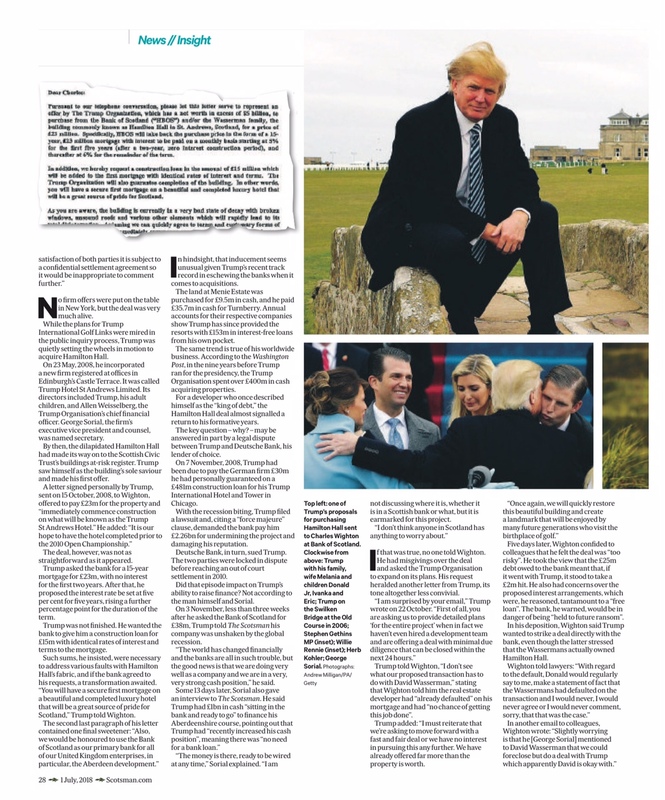 On 3 November, the day the Scottish Government granted outline planning permission for his Aberdeenshire course, and less than three weeks after he asked the Bank of Scotland for the mortgage and construction loan to bankroll his purchase of Hamilton Hall, Trump painted a rosy picture of his company’s finances in an interview with The Scotsman. Even as the world economy endured a torrid time, he insisted the Trump Organisation was immune to the woes. “The world has changed financially and the banks are all in such trouble, but the good news is that we are doing very well as a company and we are in a very, very strong cash position,” he said. He warned that the bank, should it go with Trump’s offer, would be in danger of being “held to future ransom.” Indeed, in his deposition, Wighton made clear that Trump would have preferred any deal to have been struck directly between the Trump Organisation and the Bank of Scotland, even though the latter maintained it was the Wassermans who actually owned Hamilton Hall. According to Willie Rennie, the leader of the Scottish Liberal Democrats and the MSP for North East Fife, such conduct was underhand. “This bully boy behaviour is typical of how Donald Trump behaved in business across the globe,” he said. THE TRUMP ORGANISATION was not discouraged. At the year’s end, Wighton and a colleague met up with Sorial, around which time the basis of the transaction “changed on several occasions,” according to the banker. Wighton went on to receive a “preliminary projection” drawn up by Sorial, detailing yet another offer from Trump’s camp. The correspondence went in vain. Wighton even drafted an email to Sorial, offering a breakdown of the bank’s concerns. “If you look at Bank of Scotland’s position if this deal was acceptable to all parties, you will be in possession of an iconic site, have an interest free loan for a period, have funding in place at exceptional rates for development etc,” he advised. Wighton added: “Your involvement in this project and the fact that such a once in a lifetime build would be in your possession I am sure would be a great addition to the Trump portfolio. We do though need to get the deal right from our side.” It is not known whether Wighton ever sent the draft email to Sorial. AS THE WASSERMANS’ hopes of clinging onto Hamilton Hall faded, the Bank of Scotland lost patience. A condition report of Hamilton Hall carried out by Savills at the bank’s behest depicted a grim picture of its worsening condition. It identified water damage, pest infestation, and parts of the property that were “open to the elements.” The repair bill simply to render the structure wind and watertight was put at £25,247. The letter, sent on 29 August 2007, saw, Desmond express doubts over the arrangement. He pointed out that if he bought the flat, then later sold it for £7m, the Wassermans would be entitled of around £960,000 of the profit. “It seems inequitable that a purchaser would benefit so little in the uplift in value of the original investment,” Desmond observed. On 8 August, Donald Trump Jr, who was in Scotland to check up on the progress of Trump International Golf Links, “categorically” denied his family had entered the bidding war for Hamilton Hall. “Once the Trump name is linked to a property then suddenly there is a lot of interest in the sale,” he told reporters. Neither bid found favour with the Bank of Scotland. A list of the officers received by end of the day, compiled by bank staff and seen by Scotland on Sunday, shows that there were nine bids in all. 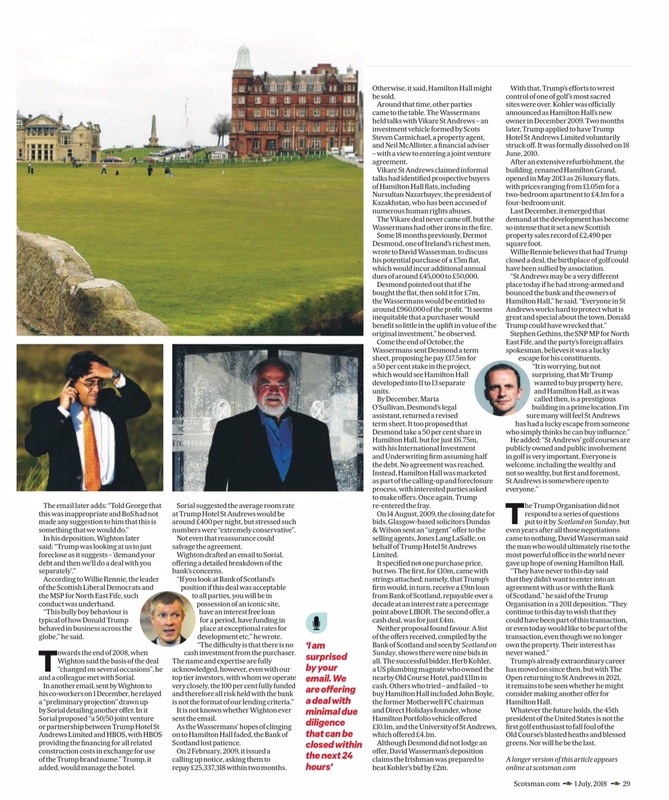 The successful bidder, Herb Kohler, a US plumbing magnate who owned the nearby Old Course Hotel, triumphed with a £11m cash offer. 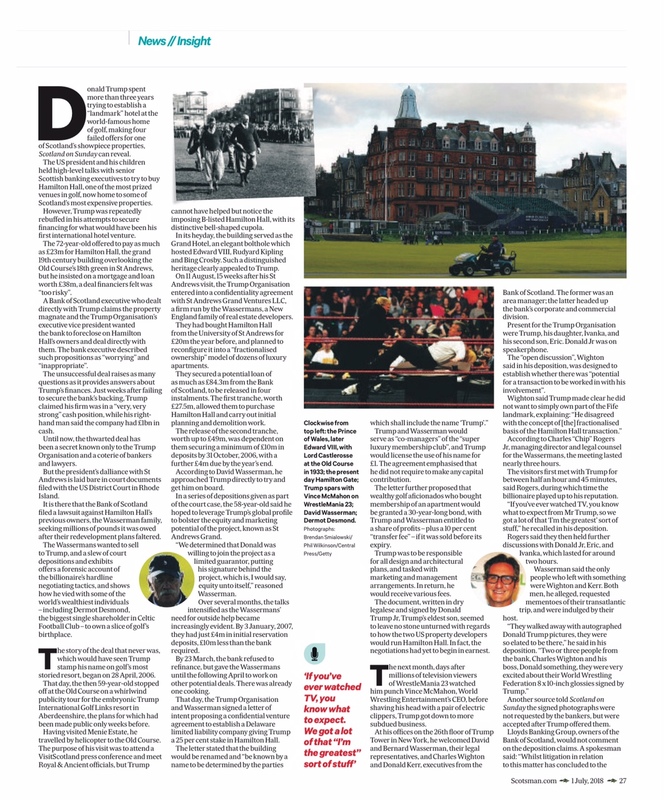 Others who tried – and failed – to buy Hamilton Hall included the Scots tycoon, John Boyle, a former Motherwell FC chairman and Direct Holidays founder turned investor, whose Hamilton Portfolio vehicle offered £10.1m, and the University of St Andrews, which offered £4.1m. Although Desmond did not lodge an offer, David Wasserman’s deposition claims the Irishman was prepared to beat Kohler’s bid by £2m. Under his stewardship, the building has been turned into 26 luxury flats, with prices ranging from £1.05m for a two-bedroom apartment to £4.1m for a four-bedroom unit. Within a month of opening, nearly half the properties had been bought or reserved. Last December, it emerged that demand at the development has become so intense that it set a new Scottish property sales record of £2,490 per square foot, with the well-heeled owners hailing from as far afield as the US, Japan, Sweden, Hong Kong, and Switzerland. Both Willie Rennie and Stephen Gethins, the SNP MP for North East Fife, believe their constituents got off lucky. “I am glad that he didn’t get away with it at this iconic location at the home of golf,” said Rennie. “St Andrews may be a very different place today if he had strong armed and bounced the bank and the owners of Hamilton Hall. Trump’s already extraordinary career has moved on since then, and with the prestigious Turnberry resort under his ownership, it remains to be seen whether he will ever consider making another offer for Hamilton Hall, although the fact The Open is set to return to St Andrews in 2021 may be a factor. So too, might the note in the latest annual report of Kohler’s company, which points out that Brexit poses a “risk” to its ongoing ability to sell apartments.